My guy likes pretty much everything I make. He never complains about my frequent dalliance into the vegetarian, vegan world although I know he loves meaty dishes. But when I get an unsolicited comment like ‘this one’s a keeper Kathy’, I sit up and take notice. 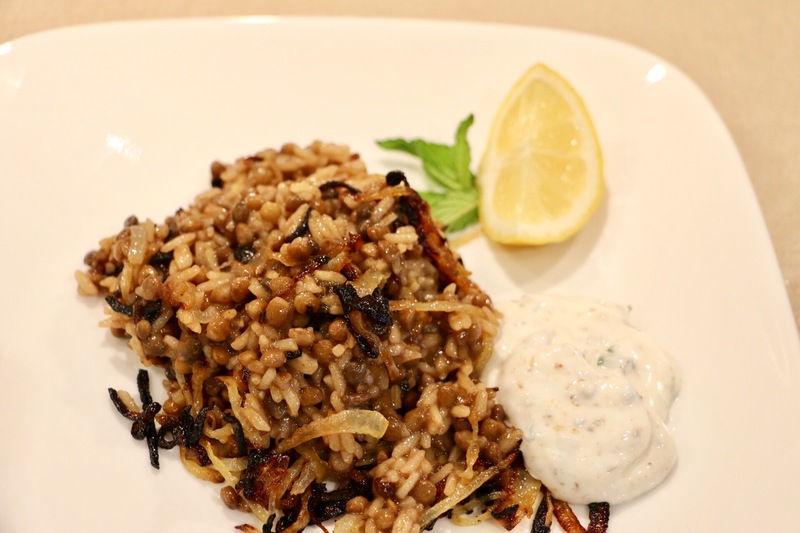 The flavours in this Mediterranean inspired dish are wonderful, the crispy fried onion the perfect complement and I think we have found a new favourite comfort food. 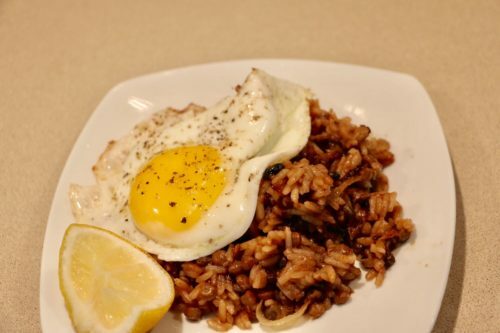 If you are lucky enough to have leftovers try reheating and top with a fried egg for a bit of extra protein. In heavy saucepan heat butter and oil. Add onions and stir over medium heat until they become limp and a bit watery. Turn up heat and continue to cook until they start to brown. Continue to brown until they become crispy trying not to stir too much otherwise they won't crisp. In same pan add cumin and allspice and stir over medium heat to toast lightly. Stir in broth, bring to a boil then add rice. Simmer until rice has cooked. 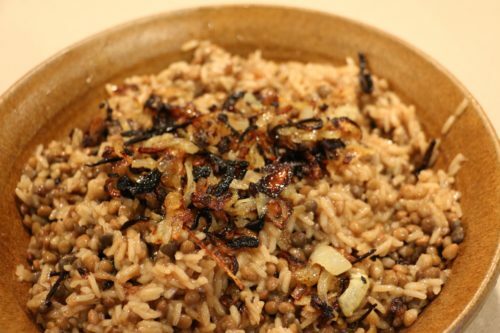 Add lentils, slivered almonds and ¾ of the onions and stir to heat through. Heap mounds of the rice/lentil mixture onto your plates. Garnish with the rest of the fried onion, mint leaves and serve with plain yogurt and lemon wedges.